Every kayaker who is going to purchase a new kayak considers the pros and cons of his choice. Weighing the benefits and costs he wants to receive the maximum value for his money. And the aim of our Intex Explorer K2 Kayak Review is to provide a comprehensive and honest view of the positives and negatives of this tandem kayak. When it comes to safety in the water, we could definitely say that no compromises are accepted. Every kayaker should be sure in the durability and the reliability of his kayak. 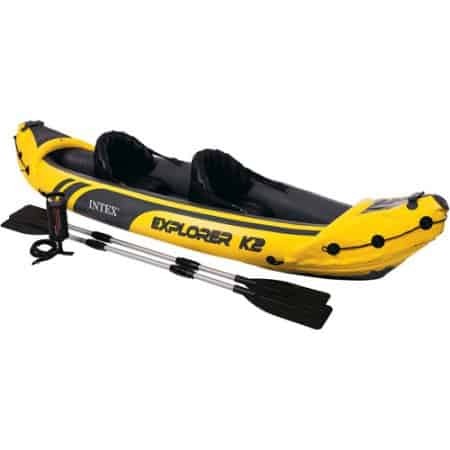 Intex is a well-known manufacturer of high-quality inflatables at affordable prices and The Explorer K2 is the perfect example. It is made of UV and puncture resistant 30-gauge vinyl. This material has proved its durability and makes the construction of this tandem kayak really reliable. However, the body of this vessel is also produced with reliability and safety in mind. So, it has separate air chambers for the bottom and for the sides of the main hull. In case a puncture occurs in one of the chambers the others will remain buoyant and help you go back safely to the shore. And this yak comes with repair patch included, which is easy to use and could be very useful in many situations. 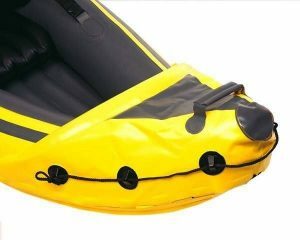 The rugged I-beam floor is designed in order to ensure the stability of this inflatable kayak. Furthermore, the head and tail ends of Intex Explorer K2 are upturned for more stability and make it difficult for capsizing. Also, the upturned nose will keep you from the water splashing. All these features together make Intex Explorer K2 well-balanced and durable inflatable kayak. As a result of the efforts of the manufacturer for safety improvements the kayak is NMMA certified and has US Coast Guards ID. Finally, we can say that this kayak will provide you enough safety and reliability, but you should always consider also your skills and experience. And you should always wear Personal Floatation Device (PFD), not only because it is obligatory in some states, but because it is for your own safety. When you are thinking about the purchase of a kayak the functionality is the main point to consider. And The Intex Explorer K2 kayak ticks the boxes for functionality. It is suitable for tandem kayaking and has an official maximum weight capacity of 400 lbs. However, this kayak is also surprisingly spacious compared to other inflatable kayaks. It provides enough room for two middle size kayakers with some gears. In addition, the two inflatable seats with backrests are very comfortable for the paddlers. The seats are attached to the floor with Velcro strips. And the kayaker could adjust their positioning based on the preferable seating arrangement. As most of the inflatable kayaks, the Explorer K2 have great portability. It is compact and lightweight (approximately 30 lbs.) and comes with useful carry bag. Furthermore, this inflatable kayak has also carrying handles, so you can easily transport and lift your yak. Finally, the storage of the kayak also is not a significant problem as it is very compact when deflated (Package dimensions – 16.25 x 23.125 x 13.5 in). And you can also check our tips for appropriate storage and maintenance of inflatable kayaks. This inflating and deflating is remarkably quick and takes only a few minutes. The Boston valves combined with the high-performance manual pump make the inflating of the kayak an easy game. So, you will not lose time preparing the kayak for the water. Intex Explorer K2 kayak is suitable for light paddling in mild rivers and lakes. While some more experienced kayakers state that it performs well in tougher conditions, we stay conservative and think that it is not a multi-purpose kayak. So, it is not very suitable for extreme kayaking or kayaking in open waters, where the weather conditions can change in minutes. Actually, the performance of this inflatable kayak in calm waters is very good. It performs very well in relation to control and maneuvering. Seems like, the removable skeg included in the package could be your best friend and to significantly improve the directional stability. 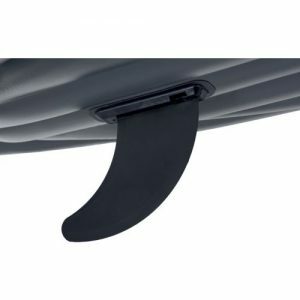 However, you should always pay attention if it is well fitted to the mount as some customers have lost their skegs in tougher conditions. The Explorer K2 comes with two 86 in. aluminum oars. Maybe, as a drawback of the paddles could be pointed the fact that they are not adjustable. So, you may feel not so comfortable to paddle with an oar that does not match your preferred size. On the other side, Intex has made the visual design of this kayak really eye-catching. They have painted the design of this kayak in lemon yellow and black. Probably, the main safety benefit of the yellow color is that it fully contrasts with the water. Kayaks are usually hard to be noticed by the other boats due to the fact that they lay low on the water. So, this color will help the others to easily spot you and could avoid unnecessary troubles. However, the black color of the bottom could be a potential drawback. As we know the dark colors absorb the sunlight and the heat increases the air pressure in the chambers, leading to over inflating in some cases. Finally, we should say a little bit about the pricing of the Intex Explorer K2 kayak reviewed above. Our opinion is that its price is very carefully selected by the manufacturer. And there is no doubt that it is one of the cheapest inflatable kayaks on the market. So, we consider the price is reasonable and advantageous for the features provided. Why should I buy Intex Explorer K2 Kayak? If you are a beginner or you are looking for a safe and reliable kayak for recreational paddling in mild lakes and rivers than you are looking at the right place. And, at the same time, it is lightweight and portable. However, if you are looking for a kayak for the open ocean or extreme kayaking, probably you should check for more suitable kayaks. Most of all, Intex Explorer K2 is a durable and sturdy inflatable kayak, while at the same time it comes at an affordable price. Additionally, it provides excellent comfort for the paddlers and very good control and maneuvering. Maybe, all these positives of the kayak are the reason for the excellent customer rating of this kayak in Amazon. Actually, minor drawbacks of this kayak are the non-adjustable oars and the manageable risk of losing the skeg. So, if the features provided by Explorer K2 don’t match your needs you can check our Complete Guide on Best Beginners Kayaks. In conclusion, Intex Explorer K2 kayak is a great option for beginners and recreational paddlers as it provides excellent value for money.